In March 2001, I headed to the Rustaveli Theatre in Tbilisi to see a production of ‘Twelfth Night.’ Electricity for street lamps had been cut off, and in the gloom crowds of men loitered on the peeling, bullet-hole-sprinkled art nouveau avenues, smoking and hoping for a passer-by to offer them work: they only took dollars, local Lari were worthless. Crossing the road took an age, the traffic lights were off, and you had to negotiate your way between speeding, rattling old Soviet cars, never quite sure whether the drivers could make you out in the dark. The atmosphere in town was tense: there were wild rumours that Russians were hiring local gangsters to undermine American plans to build an oil pipeline through the country; that the president’s son had siphoned off an IMF loan to open casinos in Monte Carlo; that Turkey was planning to hijack Georgia’s largest port. Lying between the Black Sea and the Caucuses, Georgia is at the twisted bellybutton of geopolitics, the route for trade and oil between East and West, the border of power struggles between North and South; and in the ill-lit streets, self-importance, state collapse and paranoia all combined. Saakashvili's youth, charisma, reforms and western outlook won him plaudits at home and abroad in the early days following his 2004 election. Nine years and a disasterous war later, both he and his party find themselves turfed out of government. Photo via facebook. Georgia is at the twisted bellybutton of geopolitics. Since the end of the USSR, Georgia had already experienced two failed saviours: Zviad Gamsakhurdia, translator of Shakespeare and mystic-nationalist; and Eduard Shevernadze, the ‘Cunning Fox.’ Two years later there would be a third, as the 36-year-old, American-educated lawyer Mikheil Saakashvili swept to power in the peaceful Rose Revolution. Saakasvili centralized government, returned lost lands, made Georgia one of the world’s best places to do business, applied for EU and NATO membership, made the lights work in Tbilisi, and built palaces of glass and steel. He seemed to have achieved the impossible, and was feted as the ideal post-Soviet reformer, leading Georgia full speed to the West. But this week, as he leaves the presidency after twelve years, Saakashvili’s reputation is bruised and battered, his ministers are on the run or on trial for corruption and torture, and he is accused of leading Georgia into a near-suicidal war with Russia, and trying to provoke a confrontation between Washington and Moscow. He might even face criminal charges himself. It has left his supporters and sponsors in the West with a conundrum: how are we to make sense of Misha? Is he a flawed democrat? A covert authoritarian so many fell for? Or something else entirely, which can help give us a paradigm through which to understand Georgia? 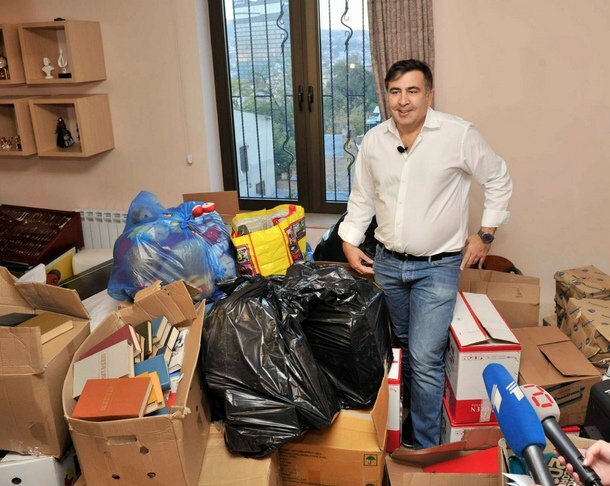 Saakashvili always had more sides to him than the Western reformist one. Saakashvili always had more sides to him than the Western reformist one: ‘My husband sees himself as a strong Georgian leader in the tradition of Beria and Stalin,’ his wife told stunned western journalists in 2003, tapping into the great confusions of Georgia’s historical narratives as she invoked the Georgian Soviet chiefs (at once, despised murderers and admired local success stories) as role models for a leader dedicated to westernising the country and overcoming its Soviet legacy. Saakashvili would later launch a de-Stalinisation campaign, but he governed on a whim, with an iron hand, and fomenting intrigue that was a soft descendant of Soviet traditions: crushing protests with violence, arresting victims randomly, and seeing Russian plots everywhere in fits of paranoia. The leader with whom he would compare himself the most was David the Builder, the great Georgian Emperor of the 12th century, the lost golden age before Georgia was subjugated by, at various points, Tamerlane, the Ottomans, Persians, and, for the last three hundred hundred years, Russia. ‘Forward to David the Builder’ was Saakashvili’s election slogan, casually integrating the role of slick-haired, shiny-suited US yuppie and medieval warrior saint. Saakashvili’s multi-faceted political personality also had a linguistic aspect: in English, he sounded like the ideal IMF reformer; in Georgian, he could speak like a feudal overlord, screaming and threatening down the phone at TV bosses when they ran the wrong sort of story about him. 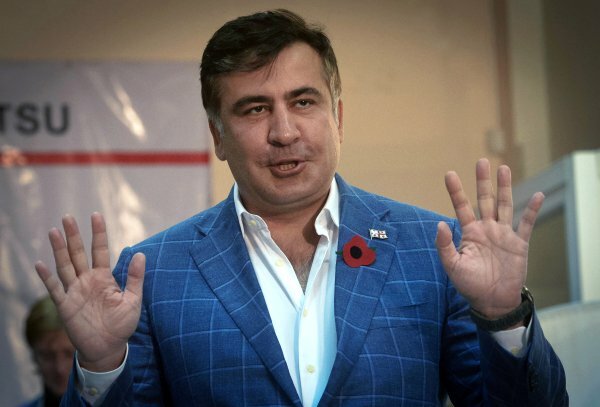 In Russian, Saakashvili could be tired and emotional; in 2007 he gave an exclusive interview, in Russian, to Newsweek’s Anna Nemtsova: disheveled, downing brandy, and biting a pear, as the fruit juices and booze dribbled down his chin, he was visibly confused and depressed. Simultaneously medieval and modern, Soviet and westernised, Saakashvili is a very Georgian product. Perched on the ‘Edge of Empires’ (the title of Donald Reyfield’s recently-published encyclopedic history of the country) Georgia is defined by improbable combinations of conflicting traditions. This works wonders for food and culture: Georgian feasts can go on for days, even in periods of hyperinflation and state collapse they continue unabated. When I visited the village of Sighnahi back in 2001, the whole town clubbed together to organise a dinner, although no one had been paid a salary for months. We sat on a veranda half way up a mountain, overlooking the great green yawn of the valley. The wine had an earthy, dank aftertaste, a consequence of being prepared in the ancient Greek manner in earthen pots underneath the soil (Georgia is reputedly the Colchis of the Golden Fleece, the eastern tip of Hellenic civilization). There was chicken in ground walnut sauce (of Persian origin), spicy adjika (Turkish), broth-filled meat dumplings (descended from the Mongol kuzhi), a red bean soup brought by Sephardic Jews who traded on the Silk Road. The table was ruled over by the tamada, the traditional benign dictator of the Georgian dinner feast, introducing topics of conversation, singing and telling stories. In rural areas, I’ve been told, the tamada’s power can be absolute: he decides whether a diner can even go to the toilet. As yet more food (trout with pomegranate sauce, lamb with plum) and local grappa was produced, the locals launched into the Georgian a capella singing that Stravinsky considered the greatest vocal phenomenon he had ever heard. Polyphonic, Georgian singing is a throbbing echo chamber of all the music that has ever passed though the country, with notes of Mongolian throat growling, Christian monk chanting, Alpine yodeling, Muslim Muhezzin, all swooping and resounding and somehow coalescing into cycles without beginning or end that stretch into the early morning. Gamsakhurdia's blend of nationalism and spirituality swept him to power in a landslide election. His presidency would last less than a year and lead the newly-born state to ethnic violence and a bitter civil war. The same polyphony that makes Georgian food and singing so glorious also makes statecraft very hard. But the same polyphony that makes Georgian food and singing so glorious also makes statecraft so hard. Tamadas and messiahs try to bind it, but the result is near madness and civil wars waged between the little republics that make up the country. In the very stress of unifying, ideological and territorial integrity end up falling apart. No one captured this better than Georgia’s first post-Communist leader: Zviad Gamsakhrdia. Gamsakhurdia had started his political career as a human rights activist, a friend of Sakharov and a translator of T. S. Eliot, William Shakespeare, Charles Baudelaire and Oscar Wilde. He had been thought of as a Georgian Vaclav Havel; Havel endorsed him internationally, as Gamsakhurdia tried to gain independence from the USSR. But Gamsakhurdia’s anti-Soviet dissidence always had a very Georgian spin: in 1956 he had formed the ‘Society of King Vakhtang’ to help cleanse Beria’s reputation from the slurs of the ‘Russian’ Khrushchev. In 1990, he laid out his philosophy in a speech entitled ‘The Spiritual Mission of the Georgian People.' He claimed that Georgian was the language of Christ, and that Georgians were descended from Prometheus who, according to legend, was tied to a mountain in the country, and who embodied the spiritual qualities of humankind pitted against the materialism of Zeus; the Golden Fleece and the Holy Grail were both located in Georgia, and the Georgian people were the embodiment of a militant holiness, characterized by the cult of St George: since the 6th century Georgia had been a Christian country in a largely Muslim region, and St George is its name-saint. The Georgian mission, argued Gamsakhurdia, was to purify the world, led by warrior-artists who were part-Knight Templar, part-romantic poets. Elements of these ideas had been present for centuries in Georgian religious, artistic and academic thought, but now Gamsakhurdia mixed them together into a political ideology; and it resonated. Surreal as this narrative seems, it was a way to make sense of Georgia’s stories. 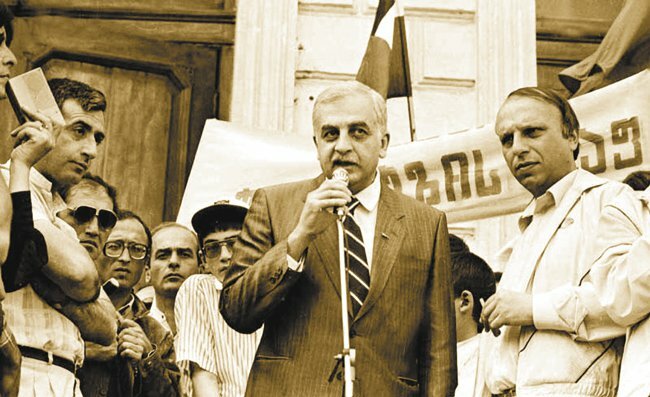 In 1991, Gamsakhurdia won 87% of the vote. ‘Georgia: choose the path of Christ!’ Gamsakhurdia would scream at rallies, surrounded by heraldic flags bearing images of St George, and giving fist-in-the-air salutes to chanting crowds, ‘and let those who take the path of Barabas be damned!’ ‘The Round Table’ was how Zviad Gamsakhurdia described his government. His Praetorian guard were the Dedrioni (‘mother warriors’), middle-aged women who stayed up all night in front of the new parliament chanting Gamsakhurdia’s name, kissing his photograph, and attacking opposition members on the street with scissors. He shut down opposition newspapers and TV stations and proclaimed ‘Georgia for Georgians.’ The new-born multi-ethnic state went up in flames. The regions of Abkhazia and Ajaria rebelled, Ossetians and Georgians burned each others' villages. Tbilisi became a war zone. Gamsakhurdia fled to Chechnya. Two years later he was dead with a bullet through the back of his skull (allegedly a suicide, but widely assumed to be murder). Saakashvili rehabilitated Gamsakhurdia, calling him a ‘great statesman and leader,’ and naming a street after him in Tbilisi. But Saakashvili’s own attempt to reintegrate the lost regions of Abkhazia and South Ossetia would end up contributing to his downfall, leading to the disastrous 2008 war with Russia. ‘Repentance’ captures the temporal and cultural contradictions of the Georgian imagination. When it was made, ‘Repentance’ was perceived as a film about the past, but it portrayed the fault lines of Georgian political psychology, which have proved prophetic. This is not to say that Saakashvili’s reforms were not at times remarkable, if not, perhaps, for the reasons he intended. In 2009, knowing his presidential term was constitutionally constrained, Saakashvili began a process of transferring power away from the presidency to parliament. Likely, he assumed that without the presidency he, or at least his party, would hold on to power by dominating the legislature. He was wrong, and his party was whipped in 2012 elections. Today, Georgia is now a parliamentary, as opposed to a ‘semi-presidential’ democracy. It might be a key moment when the polyphony has a chance to liberate itself from the dictatorial tamadas. The billionaire Bidzina Ivanishvili, however, is still prime minister while being worth 1/3 of Georgia’s GDP. Even if he does retire from the post next month, as promised, one senses that the country’s latest Varlaam figure will, at the very least, still be directing from backstage.